Right Med brings you world class rapid tests. Our rapid tests are simple to perform, fast and accurate results within minutes and can be performed at point of care settings, hospitals, clinics & laboratories. Our products are proven for their efficacy, reliability and are manufactured under stringent quality control and ISO guidelines. We continuously strive to innovate and provide affordable simple and easy to use immunoassays which can be performed anywhere.Our point of care products are HCG Card, Dengue Card, Trop I Card, Trop T Card, Lepto Card, TB Card. 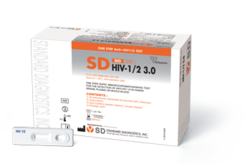 SD BIOLINE HIV-1/2 3.0 test is an immunochromatographic assay for the differential and qualitative detection of all isotypes(IgG, IgM, IgA) antibodies specific to HIV-1 including subtype O and HIV-2 simultaneously, in human serum, plasma or whole blood. Features 1. 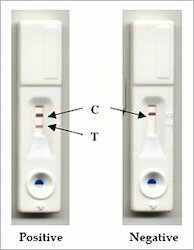 Differentiated test result between HIV type I and II by clear band formation(3-lines) 2. Specimen Serum, Plasma or Whole blood. 3. Sensitivity 100% 4. Specificity 99.8% 5. Clearance KFDA, CE, WHO prequalification 6. Available in 30 Tests pack. 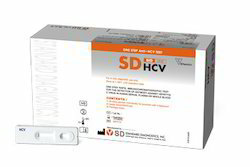 SD BIOLINE HCV test is a immuno chromatographic rapid test for the qualitative detection of antibodies specific to HCV in human serum, plasma or whole blood. With the help of our highly experienced and qualified professionals, we are offering a optimum quality Dengue IgG & IgM Test Card to the esteemed clients. Offered test pack is widely used in the laboratories to find out simultaneous detection of IgG & IgM antibodies of dengue virus through immuno chromatographic test. 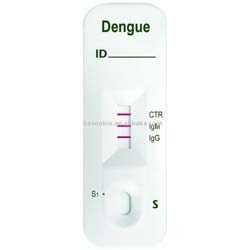 Through this we can knoe about the dengue antibodies in human blood, serum or plasma. This test pack is available in the set of 25 card. One Step Syphilis Antibody test SD BIOLINE Syphilis 3.0 test is a solid phase immuno chromatographic assay for the qualitative detection of antibodies of all iso types (IgG, IgM, IgA) against Treponema pallidum (TP). The NycoCard D-Dimer test is a rapid 3-minute test for the activation status of the fibrinolysis system. Looking for Rapid Test Card ?